Petitioners, pro-lifers, blamers, Hubble and more! So-called ‘pro-lifers’ at it again - What is moral is in the eye of the beholder. Wretched Radio blames the victims? - Yeah, everyone’s a sinner. Since the earliest days of astronomy, since the time of Galileo, astronomers have shared a single goal — to see more, see farther, see deeper. The Hubble Space Telescope’s launch in 1990 sped humanity to one of its greatest advances in that journey. Hubble is a telescope that orbits Earth. Its position above the atmosphere, which distorts and blocks the light that reaches our planet, gives it a view of the universe that typically far surpasses that of ground-based telescopes. Hubble is one of NASA’s most successful and long-lasting science missions. It has beamed hundreds of thousands of images back to Earth, shedding light on many of the great mysteries of astronomy. Its gaze has helped determine the age of the universe, the identity of quasars, and the existence of dark energy. Hubble’s discoveries have transformed the way scientists look at the universe. Its ability to show the universe in unprecedented detail has turned astronomical conjectures into concrete certainties. It has winnowed down the collection of theories about the universe even as it sparked new ones, clarifying the path for future astronomers. Among its many discoveries, Hubble has revealed the age of the universe to be about 13 to 14 billion years, much more accurate than the old range of anywhere from 10 to 20 billion years. Hubble played a key role in the discovery of dark energy, a mysterious force that causes the expansion of the universe to accelerate. Hubble has shown scientists galaxies in all stages of evolution, including toddler galaxies that were around when the universe was still young, helping them understand how galaxies form. It found protoplanetary disks, clumps of gas and dust around young stars that likely function as birthing grounds for new planets. It discovered that gamma-ray bursts — strange, incredibly powerful explosions of energy — occur in far-distant galaxies when massive stars collapse. And these are only a handful of its many contributions to astronomy. The sheer amount of astronomy based on Hubble observations has also helped make it one of history’s most important observatories. More than 6,000 scientific articles have been published based on Hubble data. The policies that govern the telescope have contributed to its incredible productivity. The telescope is an instrument for the entire astronomical community — any astronomer in the world can submit a proposal and request time on the telescope. Teams of experts then select the observations to be performed. Once observations are completed, the astronomers have a year to pursue their work before the data is released to the entire scientific community. Because everyone gets to see the information, the observations have given rise to a multitude of findings — many in areas that would not have been predicted by the telescope’s original proposals. Hubble’s success with these policies has helped spread them throughout the astronomical community, and they are becoming common with other observatories. …At the heart of STScI’s mission are outreach and education. Our Office of Public Outreach, which created this Web site, finds innovative ways to share Hubble’s remarkable discoveries with the public. OPO exists as a unique blend of communications professionals and scientists working together to prepare and disseminate the photographs and animations seen in the news… as well as posters, slide shows, exhibits, and educational products in print and electronic formats. 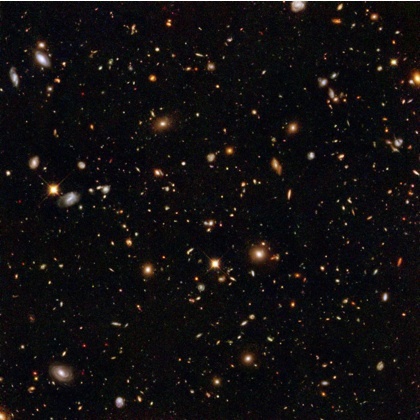 The Hubble Deep Field Images, are considered to be the most important photos of all time. And it is from those topics that the adventure begins. Along with articles, videos, magnificent photo images of our universe, taken by the Hubble Telescope of course, and honestly, so much more of that should be of interest to anyone with a pulse, I couldn’t recommend this site enough. Sure, I’ve linked to other dedicated astronomy sites, but this one just blew me away. It’s up there with the very best of them. Please take some time and explore what is being explored. The Hubble Telescope has expanded our knowledge of the universe in a way that no other telescope has ever done. And it’s still up there taking pictures! Our species needs, and deserves, a citizenry with minds wide awake and a basic understanding of how the world works. Wednesday: Hello, good night! Why isn’t “good night” a greeting if you meet at night? Will Ken Ham be interesting on CNN? Other crazy people have had air time. Setting up dates through online service, you might get what you pay for. Money is also a great attractor, apparently. If you can’t find work to make money, is waiting for an inheritance an option? Vox Day is a Mensa member, but who would want to brag about such things? ABBA is a four letter word. Also: taking on creationists in verbal debate or arm wrestling. Then we continued on with various aspects on education. Finally, Kil fired Boron10. Illustrated Stories From The Bible (that they won’t tell you in Sunday School), by Paul Farrell. Wretched Radio blames the victims? There were 7,519 daily visitors this week.